This product is not recommended for new designs. Nordic recommends the nRF24LU1+. The Nordic nRF24LU1 is a highly integrated, ultra low power 2.4GHz RF System-on-Chip (SoC) for the 2.4GHz ISM (Industrial, Scientific and Medical) band. It includes a 2.4GHz RF transceiver core, 8-bit CPU, Full-speed USB 2.0 device controller, and embedded Flash memory. With an integrated voltage regulator enabling it to be powered directly from the USB VBUS, the nRF24LU1 is ideally suited for ultra compact USB dongles for wireless peripherals. 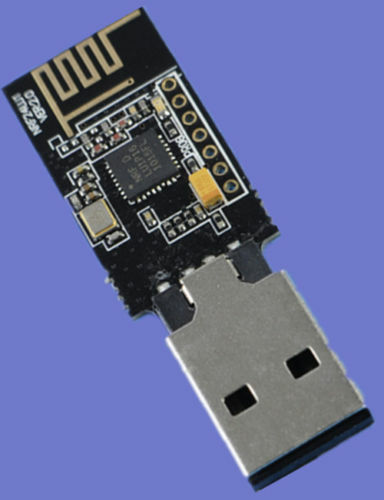 The on-chip Flash can also be upgraded over the USB interface enabling easy deployment of bug fixes and new features to end-users. The Nordic nRF24LU1 integrates a Nordic nRF24L01 2.4GHz RF transceiver core, enhanced 16MHz 8-bit 8051 compatible CPU, 2kB + 256B RAM, 16kB embedded Flash, a Full-speed USB 2.0-compliant device controller, and a range of system peripherals including a hardware AES co-processor and PWM. 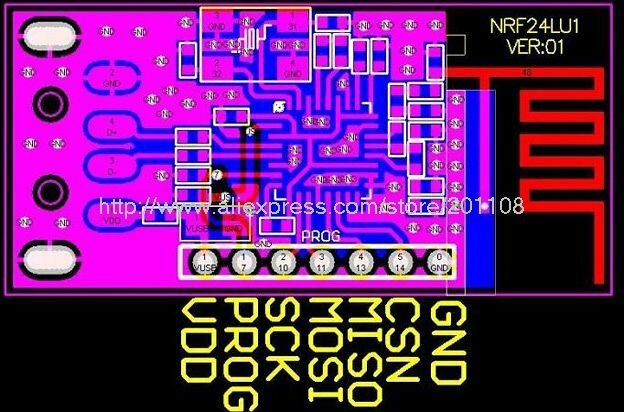 The nRF24LU1 is available in a 5 x 5mm 32-pin QFN package with 6 generic I/O pins. Compiling nrfProg requires package libftdi-dev. This dongle seems to be used mainly for the crazyfly nano. Two methods of programming. Directly using the programming port, or with a bootloader over USB. I have bought this dongle but it is not recognised in Windows 10. Following bitcraze.io instructions did not help: Zadig app does not find any device. I have the same issue. Try usb 2 port if you have one. A usb2 hub or usb2 extension cable (No usb3 cable that would be pointless) might help. Of course it is only a temporary measure. Please let me know if you found the core issue.